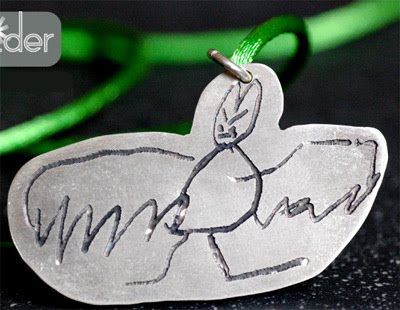 Father's Day is just around the corner, and if you are totally uninspired, prepare to be wowed by the range of Limespider customised jewellery by Kylie Gartside. 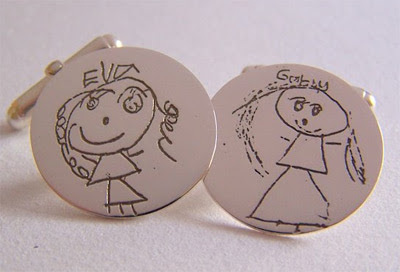 Based in Northern NSW, Kylie is a well-known jeweller who can take your child's drawing and create a beautiful piece of custom sterling silver jewellery from it. These cufflinks for Dad are a no-brainer, and I also love the pendants for Mum, Nanna, Aunt, Godmother, or any other lucky person with a special little one in their lives. You can order Limespider jewellery through the Kylie Gartside website. Pieces take up to 10 days to create, so make sure you get your orders in early. P.S. A huge thank you to Kate from Katiecrackernuts for pointing me in Kylie's direction. Too cute! What parent or grandparent wouldn't love these? I love the idea of the cufflinks for a dad who has everything and needs nothing for father's day. To have the treasured drawings from the kids is such a unique concept, one that can be cherished by dad forever.